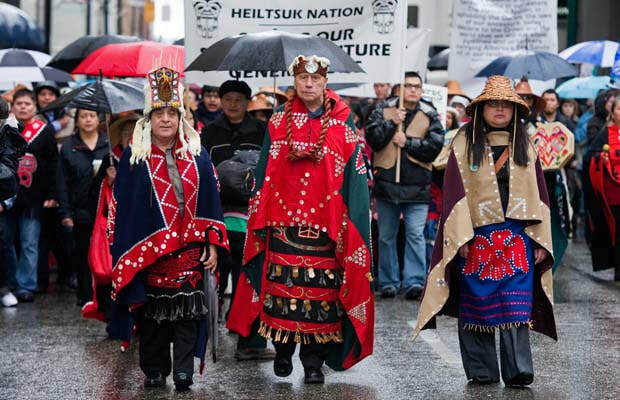 ​Founded on the Heiltsuk Potlatch concept, Heiltsuk & the Federal and Provincial Governments have entered into the Haíɫcístut Reconciliation process, to negotiate a new Government to Government relationship. ​Through this Heiltsuk driven process, we will continue to progress with the intent of governing beyond the Indian Act, reconstituting ourselves as a self-governing people, and strive towards managing wealth instead of poverty. In collaboration with the Federal and Provincial Governments, we envision a healthy and functioning community. We aim to balance the economy and the environment as we meet the needs of our people. We are creating a path forward that respects both our connection to the land and sea, and our Heiltsuk responsibility of stewardship, while building a robust and prosperous economy. There is a housing crisis in the Heiltsuk community. We see the reconciliation process as means to address this crisis. The current INAC housing regime is not working, this is an opportunity to look beyond general scope on how INAC delivers housing. Housing influences many aspects of life: individual health and well-being, educational achievement, social interactions, labor market attachment and community identity. From a broader economic standpoint, the housing sector provides employment, creates investment opportunities and stimulates and supports economic activity. Through the Tiny Homes Project, a partnership between Heiltsuk, University of British Columbia, FPInnovations, the School of Architecture and Landscape Architecture, and Mitacs, we will work towards developing environmentally appropriate, sustainable, and affordable housing to the Heiltsuk community. We aim to build 4 to 8 more tiny homes by next year. It is our vision that Heiltsuk economic development should be owned, based and driven by the Heiltsuk Nation and people. We seek to build a viable, integrated & robust economy for the Heiltsuk Nation, and secure capacity to create economic opportunities and benefits for the Heiltsuk Nation. We shall utilize an integrated and holistic approach to Heiltsuk Economic Development, while respecting Aboriginal Title and Rights of the Heiltsuk People. While asserting those Aboriginal rights throughout the economic development process. We shall foster and promote the health and well-being of all Heiltsuk peoples, and seek out meaningful employment and economic opportunities with education and employment embedded in all economic development. The Heiltsuk language is a cornerstone of Heiltsuk culture and way of life, and we want our language to not only survive, but to thrive for our future generations. Language revitalization and preservation is one of the highest priorities within our community and as such, it is one of highest priorities at the reconciliation discussions. We envision fluent speakers emerging out of this reconciliation initiative, and to have the Heiltsuk language spoken conversationally. We commit to working together as Nation, sharing resources, ideas, time, and responsibility for the process of revitalizing and safeguarding our Heiltsuk language. Speaking our Heiltsuk language is a form of healing for Heiltsuk people and territory. Building on existing language programs, we will work towards revitalizing the Heiltsuk language through programs like immersion so that we can restore it into the daily lives of Heiltsuk people. We believe that both natural and cultural resources must be sustained to maintain and safeguard our direct connection to our territory and their resources. The rights and opportunities of the Heiltsuk people to hunt, fish, harvest, trap and otherwise use the land and sea resources for cultural, spiritual, sustenance, economic and trade uses must be assured and take precedence over all other uses, as identified in the doctrine of priority. For too long the Heiltsuk have sat on the side-lines while others have realized economic well-being off of the resources in our territory. Heiltsuk marine economic development and diversification is required to create both employment and entrepreneurial opportunities to manage our marine resources based on our traditional laws, knowledge and values. These values respect our balance with nature, recognize the connection between the land and sea, and understand the importance of educating our children and leaving resources for our children’s children. We will focus on building opportunities such as one shellfish aquaculture opportunity for the first year, two for the second year, and so on. We strive to provide ample opportunities for economic growth for the Heiltsuk, as well as sustaining entities such as the Bella Bella Fish Plant. While asserting our Heiltsuk title and rights, we will use our traditional laws and knowledge, and participate in a co-jurisdictional relationship with other levels of government. It is our vision to create a healthy marine environment, a strengthening of our cultural, spiritual, linguistic, political and social freedoms, and a sustainable economy that allows Heiltsuk people to once again thrive as Marine People. In closing, the Hemas, Heiltsuk Tribal Council, and the technical support team are committed to keeping you informed and actively participating in this process of reconciliation. We want you to feel comfortable engaging with both the leadership and staff that are involved in this process. We are optimistic there will be successful opportunities throughout the next three years. Canada has identified Heiltsuk as leaders in reconciliation. We see ourselves as leaders of our era, reasserting Heiltsuk values of title and rights and responsibility. Please watch out for community and other engagement sessions.